Late Colonel Avinash Chandra and I joined the Regiment in January 1983. He was a Captain then and was returning to the Regiment after a staff tenure and I was joining on commissioning as a Second Lieutenant. He, on promotion to the rank of Major was appointed the Battery Commander of the Jat Battery – 752 Medium Battery. All the officers – both seniors and juniors – addressed him as Guruji. He was indeed a Guru on all matters, especially for us, the young officers of the Regiment. For us, he was the go-to man for all our problems – military, administrative, personal, promotion examination – and all the activities we young officers indulged in. He was always ready to help, but the only catch was that it came with a liberal dose of advice, anecdotes and stories. It appeared to us from all his sermons that there was nothing under the sun which Guruji was unaware of and there was no activity Guruji had not indulged in. As expected, in all his adventurous stories, he was the pivotal character. We knew the percentage of truth in all his stories, but we all looked forward to listening to them. Whatever may it be, he had a solution in hand for all our problems and we all did enjoy his sermons. During the Winter of 1985, the Regiment went through a training exercise conducted by the Brigade Commander. Next day, during the officers’ tea, Colonel Mahaveer Singh, our then Commanding Officer ordered that henceforth Major Avinash Chandra will not be addressed as Guruji, especially by his junior officers. It was all because our Brigade Commander during the exercise was peeved at a senior Major of the Regiment being addressed by his nickname. Guruji immediately said that he loved everyone addressing him as Guruji and if need be, he was ready to meet the Brigade Commander with this special request. That was our Guruji for all readers. Guruji would take on any task everyone would find uncomfortable with. He would make such tasks appear simple and easy and conveyed an impression that he did enjoy executing it. His body language and mannerisms always added colour to such occasions. One such task was engaging a target with Artillery fire using the infamous Range Finder DS1, The equipment is now obsolete and in my view should have been declared so even in those days. Everyone was literally scared of the invisible floating diamonds and no one wanted to touch it with a barge pole. Here now appears Guruji, full of confidence, to execute the arduous task. I always failed to understand as to how he would have executed the task with a failing eye-sight, corrected with glasses. Did he ever catch a glimpse of the five diamonds, mostly invisible to people with perfect eyesight? 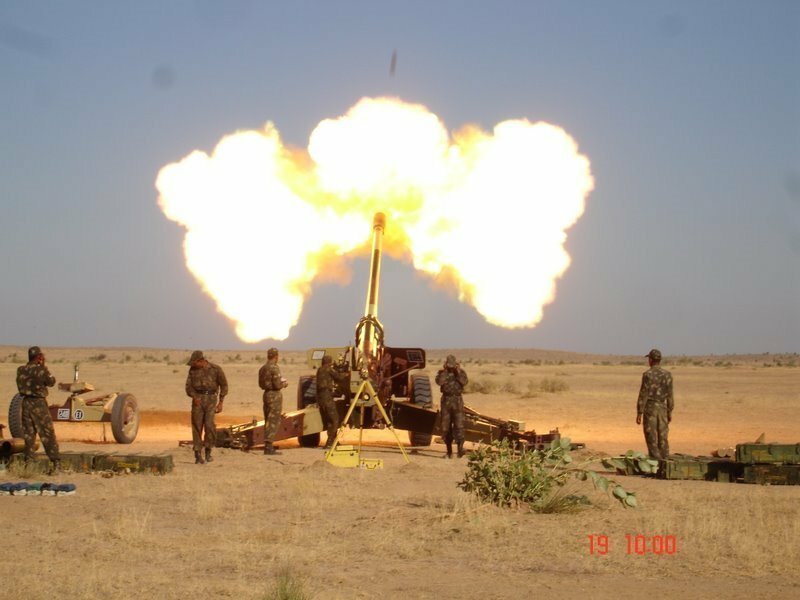 The aim of engaging a target with artillery fire is make the shells fall on or as close to the target as possible to destroy it. The guns are placed well behind at about 10 km or more and the Observation Officer is located with the attacking or defending infantry unit. The Observation Post Officer (OP officer) is responsible to direct Artillery fire on to the targets, keeping in mind the safety of own troops. The Gun Position Officer at his Command Post near the guns would calculate the bearing, distance and other technical parameters to the target, based on the coordinates passed to him by the OP Officer and apply corrections to compensate for the prevailing metrological conditions like wind speed and direction, temperature, etc and fire a single shell called a ranging round. If the initial shell is not ‘on target’, corrections to move the fall of shot is ordered and is applied on the guns. This procedure called Ranging is continued until the shell lands within 50 meters of the target. He then calls for ‘fire for effect’ by ordering six or more guns to fire in unison until the target is destroyed. During all the Artillery firing practices, Guruji would setup the monstrous looking Range Finder well before the commencement of the practice. When his turn to engage the target came, he would wipe his glasses clean, wear them and move to his trusted Range Finder. He would then instruct his radio operator to pass the target coordinates and other details to the guns with an order for a single gun to fire a shell. The use of the rangefinder, supposedly, was to eliminate the ranging process to the extent possible, and directly order ‘fire for effect’, to improve what in gunnery terms is called ‘First Salvo Effectiveness’. But the problem was that the range Finder DS1 was infamously unreliable and everyone other than a handful of personnel specially trained on it, kept a safe distance from the instrument. Five seconds before the shell was about to land, his technical assistant would cry “Stand by” and Guruji would place his spectacled eyes on to the eyepiece of the Range Finder. After the shell exploded, he would look at it over the Range Finder and then through it. He would then pickup his pad and write down a few calculations and would order a correction to bring the shell to fall on the target – Right 275, Add 375- with an order for six guns to fire in unison. Captain Desh Raj, the senior most among us Captains at that time would order us to summon all our Gods to ensure that the shells landed on the target. Believe it not, in almost all cases the shells did land on the specified target. Was it because of Guru’s gunnery skills or our prayers? Whatever it may be, the entire act did impress everyone present, especially the senior commanders. After about two or three such experiences, I confronted Guruji to explain as to how he managed the show. He explained that he neither saw the floating diamonds nor the target through the Range Finder. He was mostly successful as he knew the firing ranges like the back of his palm. He knew the lie of the ground and could predict accurately how the shell would move with each correction. The most critical moment for him was when he looked over the Range Finder to catch the glimpse where the shell exploded. He would then assess the deviation from the target and order the necessary corrections to the guns. With or without RF, most of us did shoot ‘Bhagwan Bharose’!!!! Late????? What happened to such a wonderful officer? The Army, and Arty in particular, is poorer for this loss. Did bring out nostalgic memories of a bygone era. Good reading. Why is it called God Speed and Good Shooting ? Godspeed likely originated as a secular formula “good speed” (“good luck”), but due to a phonological change in Middle English affecting long vowels in close syllables followed by one or more syllables the vowel of the first word was shorten, becoming homophonous with God, thus giving rise to a reinterpretation of spede as a causative verb meaning “cause to succeed” and resulting in formations like God spede “God prosper (you)”. While Good-bye originally had religious connotations, being a shortened form of “God be with you/ye.